Earlier this week, FICO revealed that more and more consumers are living without credit cards, despite the apparent growing popularity of plastic. The biggest decline was seen in the 18-29 year-old age category, where the percentage of consumers without credit cards has nearly doubled in seven years. Back in 2005, about 9% of those in that age group didn’t have a credit card – fast forward to late 2012 and the number nearly doubled to around 16%. The good news is that this trend has led to a sizable reduction in credit card debt – the average consumer in the 18-29 age group had $2,087 in outstanding credit card debt as of October 2012, down from $3,073 five years earlier. The declines in credit card use are similar in other age groups, aside from the 60+ category, whose members seemingly can’t change their ways. It looks like about 8% of those aged 30-39 do not have a single credit card in their wallet, up from 4% in 2005. In the 40-49 age group, about 4% don’t have credit cards, also nearly double the 2005 level. The trend is similar in the 40-49 and 50-59 age groups, but drops off in the 60+ category, as mentioned. Why Are Fewer Consumers Using Credit Cards? There are probably a number of reasons. One could be the recent economic downturn, which among other things, involved credit card issuers closing cardholders’ accounts involuntarily. FICO analyst Frederic Huynh attributed it to two other issues – the CARD Act, which has made it more difficult for card issuers to dole out credit cards, especially to younger consumers. He also said the recession has had a negative impact on consumer attitudes toward credit. In short, consumers seem to be shunning credit cards, perhaps because of their costly finance charges, their ability to land users in debt, and the fact that they can destroy users’ credit scores. There has also been a rise in the use of debit cards and prepaid cards as a safer and equally convenient alternative, which explains why so many card issuers are offering prepaid cards nowadays, such as Chase Liquid or American Express Bluebird and Serve. Additionally, anyone can get approved for prepaid credit cards. However, they don’t build credit history, which is a huge negative. While there are plenty of valid reasons to avoid credit card use, those rectangular pieces of plastic are also very instrumental in building credit history. In fact, for most consumers, a credit card is their first line of credit, and acts as a stepping-stone to get approved for other important credit lines in the future, such as auto leases and home loans. Without the presence of the credit card on your credit report, it will be very difficult to get approved for larger loans, as you typically need several open lines of credit to prove you’re worthy enough to carry large amounts of outstanding debt. Sure, a student loan or two will help your cause, but you’re still making things hard on yourself by not keeping at least three active lines of more traditional credit open. And guess what, those student loans will eventually disappear, so you’ll need another line of credit to keep your credit history active. Without active and deep history, your credit score will suffer, and that will mean higher interest rates on loans you’ll eventually need, such as a mortgage. Why subject yourself to paying more simply because you dislike credit cards? 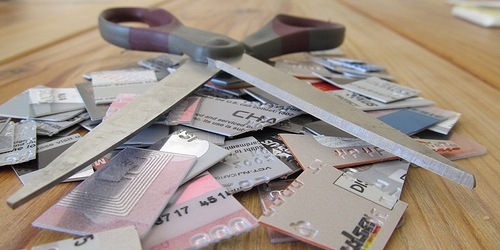 If you can’t handle the responsibility, cut up your card and just use it to automatically pay a bill each month. That way you won’t be tempted to charge beyond your means. In the meantime, it will boost your credit score. But perhaps a better idea is to stash it away and only use it for emergencies. After all, it’s nice to have a financial lifeline, just in case you find yourself without cash. By the way, a recent study from Credit Karma revealed that consumers with more credit cards had higher credit scores. Go figure. Read more: The pros and cons of credit cards. Previous Previous post: Are Credit Cards Recyclable?